Scientists from the University of Liverpool have used new data which indicates that the Earth’s inner core was formed 1 – 1.5 billion years ago as it “froze” from the surrounding molten iron outer core. The inner core is Earth’s deepest layer. It is a ball of solid iron just larger than Pluto which is surrounded by a liquid outer core. The inner core is a relatively recent addition to our planet and establishing when it was formed is a topic of vigorous scientific debate with estimates ranging from 0.5 billion to 2 billion years ago. In a new study published in Nature, researchers from the University’s School of Environmental Sciences analysed magnetic records from ancient igneous rocks and found that there was a sharp increase in the strength of the Earth’s magnetic field between 1 and 1.5 billion years ago. 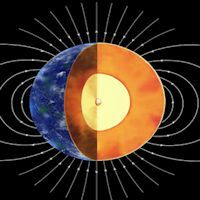 This increased magnetic field is seen as a likely indication of the first occurrence of solid iron at Earth’s centre and the point in Earth’s history at which the solid inner core first started to “freeze” out from the cooling molten outer core. Liverpool palaeomagnetism expert and the study’s lead author, Dr Andy Biggin, said: “This finding could change our understanding of the Earth’s interior and its history. 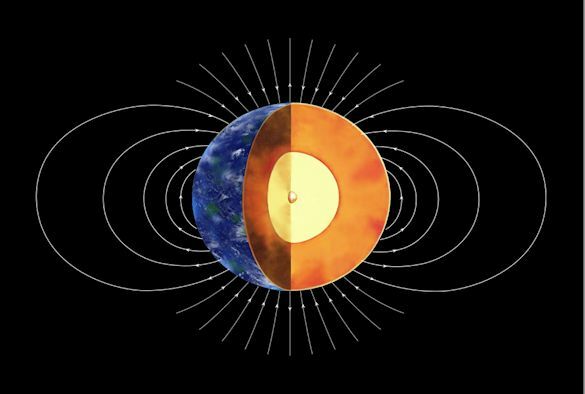 “The timing of the first appearance of solid iron or “nucleation” of the inner core is highly controversial but is crucial for determining the properties and history of the Earth’s interior and has strong implications for how the Earth’s magnetic field – which acts as a shield against harmful radiation from the sun, as well as a useful navigational aid – is generated. The Earth’s magnetic field is generated by the motion of the liquid iron alloy in the outer core, approximately 3,000 km beneath the Earth’s crust. These motions occur because the core is losing heat to the overlying solid mantle that extends up to the crust on which we live producing the phenomenon of convection. Once the inner core started to freeze, this convection received a strong boost in power because light, non-metallic elements remained molten in the outer core and were buoyant relative to the overlying liquid. The process continues today and is thought to be the main source of “fuel” for generating the Earth’s magnetic field. Dr Biggin, from the School of Environmental Sciences, added: “The theoretical model which best fits our data indicates that the core is losing heat more slowly than at any point in the last 4.5 billion years and that this flow of energy should keep the Earth’s magnetic field going for another billion years or more. The study, published in the journal Nature, is a collaboration between scientists at the Universities of Liverpool, Helsinki, Michigan Tech, UC San Diego, and the Chinese Academy of Sciences.